I first came across Dorothy Leonard in 2005 thanks to her book Deep Smarts®: How to Cultivate and Transfer Enduring Business Wisdom which she co-wrote with Walter Swap. 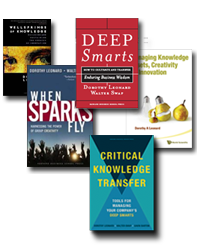 Now she, Walter Swap and Gavin Barton have followed up with a new book called Critical Knowledge Transfer: Tools for Managing Your Company's Deep Smarts®. I spoke to Dorothy and Gavin about this work. David Creelman: The wave of baby-boomer retirements is leading companies to think about knowledge loss. Some continuity processes just ask the retiring manager to inform their successor what they are working on and where the files are. You have a deeper focus. Dorothy Leonard: Yes, our focus is on deep smarts and by that we mean experientially derived knowledge that is critical to the organization and is typically developed over decades. There are really two kinds of deep smarts: one is the person who knows the legacy systems and has that crucial historical knowledge. Of more interest to us is the person everyone goes to for certain kinds of problems, the person who has such a breadth of experience that he or she can attack almost any problem, or if not, knows who to go to. Gavin Barton: That latter aspect, knowing who to go to, is often an important part of deep smarts. The expert has a web of important relationships because people with deep smarts tend to know other people with deep smarts. DC: How are organizations tackling the potential loss of critical knowledge? DL: Some are doing very little, but you find others like Baker Hughes who have taken a very disciplined approach to finding out where critical knowledge is, how likely the person is to depart, and how hard it will be to replace them. Then they focus their efforts on critical knowledge transfer. DC: One of the things I liked most about your book was the detail on methods for knowledge transfer?and they all seemed quite doable. How would you advise people to choose between the methods? GB: One of the issues is how long you have before the expert leaves. If you have 3 weeks you use a different method than if you have 3 years. DL: Another factor is how much of the knowledge is tacit. If it's tacit the experts will struggle to articulate it. There are certain methods specifically designed to get at tacit knowledge. The technique we developed ourselves is called OPPTY and is a structured process of guided experiences. DC: What can go wrong with knowledge transfer? DL: Experts may not be good at teaching; you can't transfer deep smarts in a lecture, you have to guide the person through problem solving, and that means the expert has to sit on their hands as the "nexpert" (as we like to call the learner) grapples with the problem. Experts have told us that it can be hard work to be that patient. Another problem is there may be too big a knowledge gap between the expert and learner; in such situations, the expert wastes a lot of time explaining fundamentals. GB: The other thing is that there may be barriers to going forward, such as the expert's not having any time to participate in knowledge sharing, and when managers fail to address those barriers, knowledge transfer doesn't happen. DC: Are experts willing to share knowledge? GB: Many are, but not all. Some say "I learned the hard way, they can too," or they may be hoping the company will hire them back as a consultant or may simply not care enough about the company to want to make the effort. But while it's true that resistance can happen, a great many experts are more than happy to share. DC: How do you fit knowledge transfer into existing processes? DL: Some companies build this as a new process specifically aimed to tackle the problem of critical knowledge loss. It can also be part of a talent review process or built into the mentoring process. Workforce planning, which typically looks at retirement issues, is another place to raise the issue of knowledge loss. Ideally you are not waiting until someone is on the way out the door before you start transferring deep smarts; it's best if there is a culture of learning that makes knowledge transfer a part of everyday work. GB: And it works best if it is a collaboration between expert and nexpert. It shouldn't just be the expert pushing out information, or the nexpert seeking to acquire information, they both should be working together on the knowledge transfer. DC: What happens if you transfer critical knowledge and your nexpert leaves the company? DL: That can happen and if it does it can discourage the expert. The most practical thing is to pass the knowledge to more than one person. DC: Thanks, I know this can be a hidden problem because as long as the expert is there everything runs smoothly and managers may not realize how dependent the company is on that one person. HR should have conversations about this with business leaders, and nudge them towards figuring out just how at risk they may be when they start losing deep smarts.